Brace yourself for a totally new experience in cutting-edge animation. 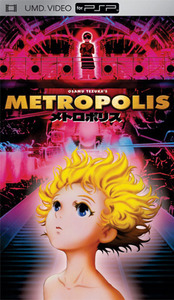 Based on the classic comic created by Osamu Tezuka (Astro Boy), written by Japanese anime legend Katsuhiro Otomo (Akira) and directed by Rintaro (Galaxy Express 999), Metropolis is a spectacular film featuring stunning imagery and unforgettable characters. In the industrial, tri-level world of Metropolis, Duke Red is a powerful leader with plans to unveil a highly advanced robot named Tima. But Duke Red's violent son Rock distrusts robots, and intends to find and destroy Tima. Lost in the confusing labyrinth beneath Metropolis, Tima is beginning a friendship with the young nephew of a Japanese detective. But when Duke Red separates the two innocents, Tima's life - and the fate of the universe - is dangerously at stake.